Watch the webinar Building success with a Raspberry Pi! With a small footprint and serious power, Ubuntu Core reduces hardware costs while still running 4k video. A low cost, open source solution, it builds from its heritage on servers to bring a secure and stable platform, designed for 24/7 availability and resistant to screen takeovers and other attacks. Ubuntu Core gives your screens the uptime and robustness you need. Uniquely stable and secure, it is based on the same operating system that runs the majority of the world’s clouds. Ubuntu Core adds the ability to upgrade the entire software stack remotely and securely, from the kernel all the way up to the apps. Canary rollout and rollback capability gives you peace of mind during upgrades: if anything goes wrong, the device automatically reverts to the last working release. With update management facilities to manage roll-out as you wish, Ubuntu Core is the ultimate digital signage OS. The Ubuntu Core app store makes it easy for systems integrators and device makers to find solutions, while enabling OEMs to generate revenues from their devices over the entire lifetime of their products. The world's most popular digital signage player for the Raspberry Pi. 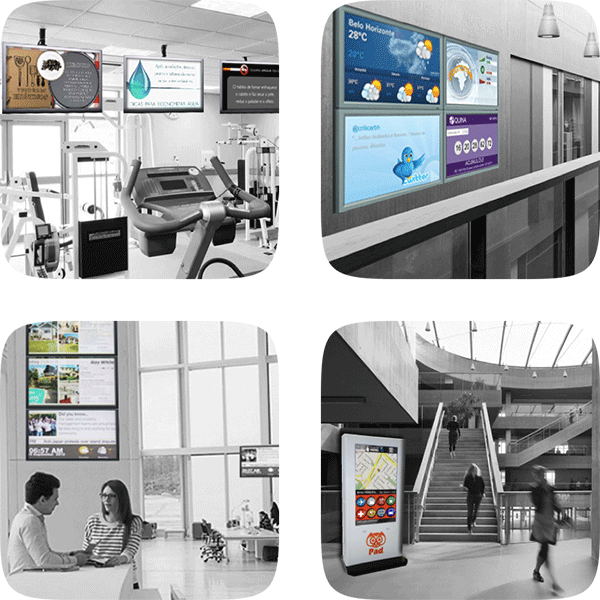 A complete digital signage solution to create, manage and play your digital content, and analyse your audience. Small size, low consumption, fanless operations and low cost mini-PC for digital display or retail kiosks. A simple solution for delivering content worth sharing to digital signage everywhere. With Ubuntu Core, digital display owners can innovate at speed, thanks to the wealth of innovative apps already created by our partners. Use data triggers to schedule content. Turn a digital signage player into a 4G base station. Turn your digital sign into a people counter. Ubuntu Core is entirely open source and supports a range of digital signage players. Just install it on a Raspberry Pi or NUC, download the app of your choice, create an account and you’re ready to go.